They spoke of how future generations may regard their findings. They showed slides of distant stars. They offered analyses and comparisons. But in the end, it all came down to this: Earth-like planets may be quite common. 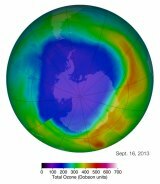 Is it possible that NASA has given us good news about the ozone? Astronomers have discovered a world just 80 light years away from Earth and floating alone -- without a sun. The comet Siding Spring recently made a close flyby of Mars, and thanks to the Hubble Space Telescope, it was captured on camera. THIS OLD SPACE STATION: Anyone who follows the International Space Station knows that it is like an old house – a high-tech old house floating about 200 miles above Earth.